BENTON CITY, Wash. — If not for Larry Pearson, the top of Washington’s famed Red Mountain’s Sunset Road might look similar to the housing development at the bottom. Fortunately, in 1984, he began to purchase small chunks of property to create Tapteil Vineyard Winery. The next year, the civil engineer from the University of Washington began planting, and three decades later, his holdings span 30 acres of vineyards, sales to some of Washington’s most famous winemakers and his own 850-case winery and tasting room managed by his wife, Jane. And Friday, he begins serving on the board of the Washington State Wine Commission. Pearson, who grew up near the Washington coast in the city of Aberdeen, first graduated from the University of Washington with a degree in aeronautical engineering, but with Boeing in the middle of layoffs, he altered his focus and took a job teaching in Australia. He returned with a deeper interest in fine wine, particularly Cabernet Sauvignon, and his work around the world for Parsons Corp., would continue to feed that. His search began in the Yakima Valley, but research and conversations with industry leaders led him to Sunset Road in the spring of ‘84. And he brought his tent. 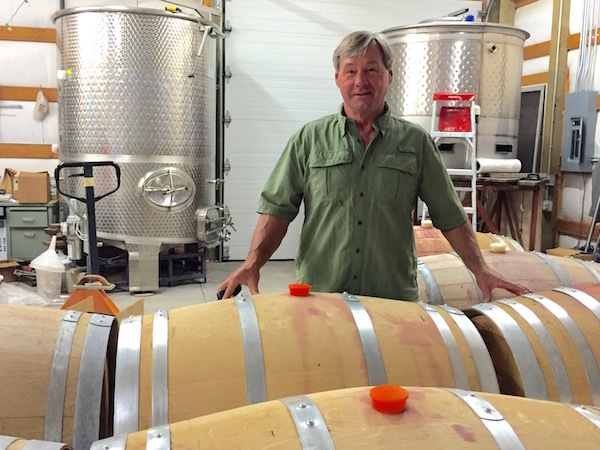 Even though he’d been making wine in small amount for private consumption, commercial winemaking was nowhere on his radar, but he knew his path — thanks to research performed by Washington State University and Red Mountain pioneers Jim Holmes of Ciel du Cheval Vineyard, John and Scott Williams of Kiona Vineyard Winery and grower Fred Artz, who died last year. While others planted a wide variety of grapes, Pearson chose clone 8 Cab for his deep layers of wind-blown loess soils. And when he learned that the clone 8 material he was purchasing from a Prosser nursery came via cuttings off Ste. Michelle’s now historic Cold Creek Vineyard, it was another piece that magically fit. 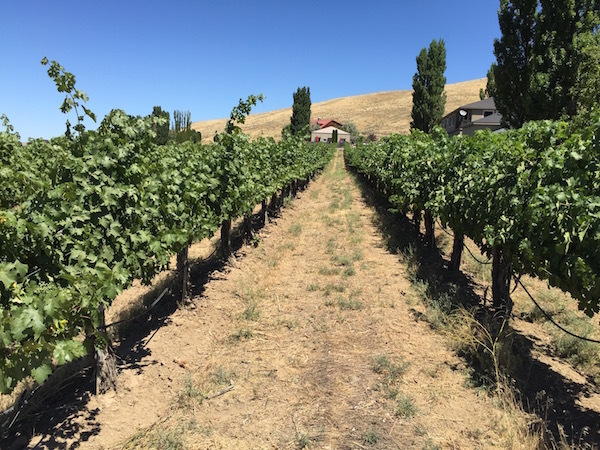 His acreage on Red Mountain is small compared with his neighbors, and while he’s added Cabernet Franc, Merlot, Syrah, Grenache and Mourvédre, it’s Cabernet Sauvignon that has emerged as king of Washington’s smallest American Viticultural Area. This year, which marks the 30th anniversary of Tapteil Vineyard, harvest is shaping up to be historic for myriad reasons. Some vineyard managers are predicting grapes for red wine will be coming off Red Mountain in August. Last year, Pearson began picking Sept. 3. In 2013, it was Sept. 4. Each year, he starts by bringing in Merlot, but historically, the average start of harvest was Sept. 10-12. Study and research have been passions for Pearson, and he seemingly has made few missteps along the way. Even his name for the vineyard fits the region. He began planting his vineyard in spring 1985, and that fall led him to Washington, D.C., for an engineering job. It paved the way to hours spent in the Library of Congress. “During a very long Thanksgiving weekend, I came across the word tapteil, and it rang a bit,” he said. “It meant something, too. 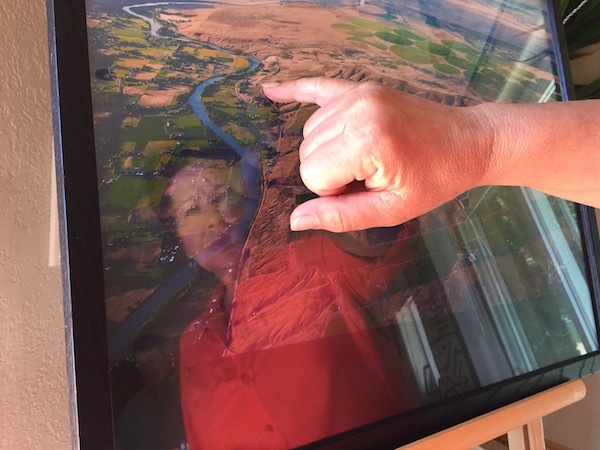 It’s a direct reference to the Yakima River, and the translation means “narrow” and refers to the portion of the river as it flows out of the gap. The people who lived in this lower part of the Yakima River were referred to as Tapteilmin. The Pearsons embraced the Sahaptin language of the Yakama Nation, applying names to their other two vineyards — Alayt (“riverside”) and Spilya (“coyote”). 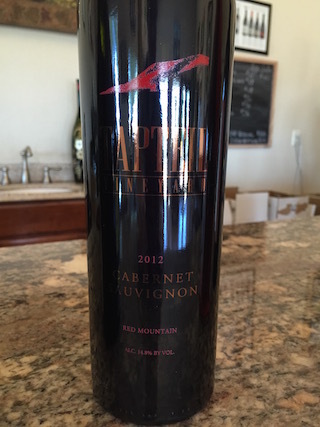 Beyond that, though, the terroir of Red Mountain fits the style of grapes and wines he creates. “My palate has always been very robust and deep-flavored with nuance that’s long-lasting and complete — something a Cabernet can really fulfill,” he said. 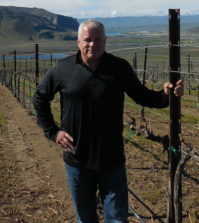 In the past decade, though, he began to embrace Syrah, Grenache and Mourvédre, which syncs up with consumers’ recent interest in GSM-style blends. At this point, there are no plans for new plantings, but he knows what directions he would take if he did. Pearson quickly found buyers for his Cab. In time, Pearson’s list of customers past and present indicates his success as a grower. There’s Quilceda Creek, Woodward Canyon and Long Shadows, as well as Barrister, Eisenhower, EMVY, Robert Karl and the Boeing Wine Club. In Oregon, it’s been Cana’s Feast, Lady Hill and Pamplin. 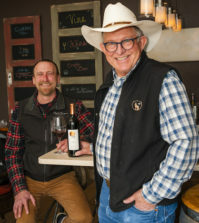 Woodinville winemaker Ben Smith of Cadence and Ron Coleman of Tamarack Cellars in Walla Walla have made vineyard-designate wines featuring Tapteil for years. By 1998, Pearson decided to hold back some fruit to start his own brand. 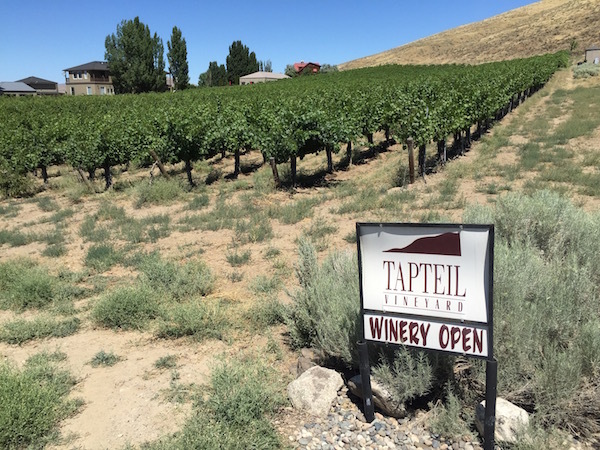 That first wine, the Tapteil Vineyard Winery 1998 Merlot, proved to be the most important because of the impression it made on Jane, a longtime friend of Larry’s sister Jacquie. In 2001, the two women made the trip from Aberdeen to Red Mountain for Catch the Crush weekend, and Jane immediately had a crush on Jacquie’s brother. “For years we called it ‘The Charm Wine,’ ” Jane said. “When I left here the first time, I left with a bottle of it and some grapes. I would eat a grape every day, and whenever the grapes were gone I would have a sip every day of this wine that I would hide from my friends. The Pearsons married in 2004, and Larry said that special wine continues to hold up well. If not for the Pearson family, Tapteil would not exist, Larry said. “My mom, my dad, my brother and friends and other family members would help keep this going,” he said. Pearson traveled extensively during his career as an engineer with an expertise in public works management. He spent three years in Tanzania and three years in Sarajevo after the Bosnian War during his time with Parsons’ transportation group. By the time he met Jane, Pearson maintained a residence in Olympia because he worked with the Washington State County Road Administration Board. “The job meant going to all 39 counties of Washington state to implement maintenance management systems,” he said. On weekends, Larry would meet family and friends at Tapteil, and the work ultimately took on an infectious tone. A year after he married Jane, Jacquie and her husband, Dave Stephens, created Songbird Vineyard — less than a quarter-mile from Tapteil’s site for Riesling. But Tapteil’s winery business didn’t take off until Jane, who spent years as advertising director for the Daily World in Aberdeen, became part of the picture. Her sales and marketing expertise complemented Larry’s winemaking skills in the business, and the tasting room also became a gallery for her wine-country paintings. She graduated from the University of Idaho with a degree in fine arts. 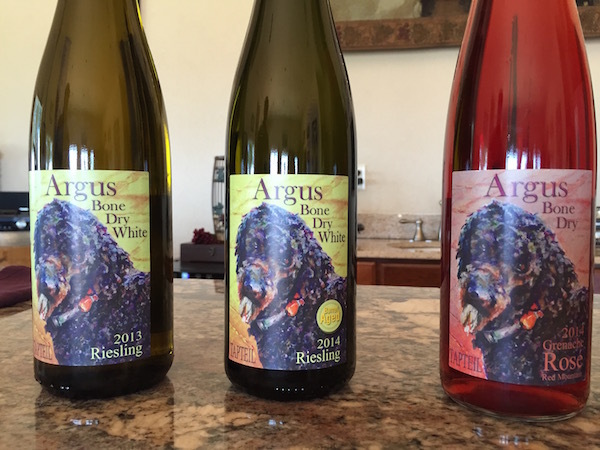 Jane’s first marriage led her to Germany, where she “cut her teeth on Riesling.” On Red Mountain, it doesn’t pencil out as well to raise Riesling, but as the Pearsons began to develop their winery and wine club, they saw the need for a white wine. 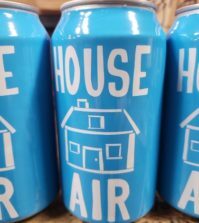 And it gave them a use for 5 acres of property they acquired along the Yakima River. So they planted 2 acre of Riesling on Alayt Vineyard, and Larry produces it in scintillating style. His chemistry target is 22 Brix, a pH of 3.0 and a total acidity of 8.5 to 9.0 grams per liter. He ferments it essentially to completely dry — 0.07% residual sugar. 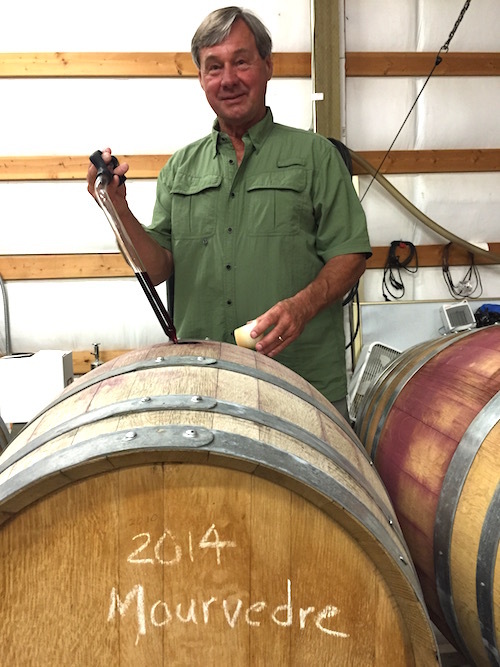 He also creates 50 cases of a barrel-fermented Riesling. The Pearsons now keep 15 percent of their fruit to feed the winery, which has nearly doubled in the past five years. 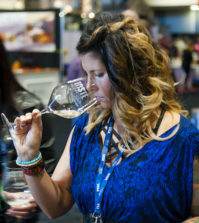 Wine sales are limited to a couple of Tri-City restaurants, Purple Café and Wine Bar in Bellevue, Tapteil’s tasting room and wine club. 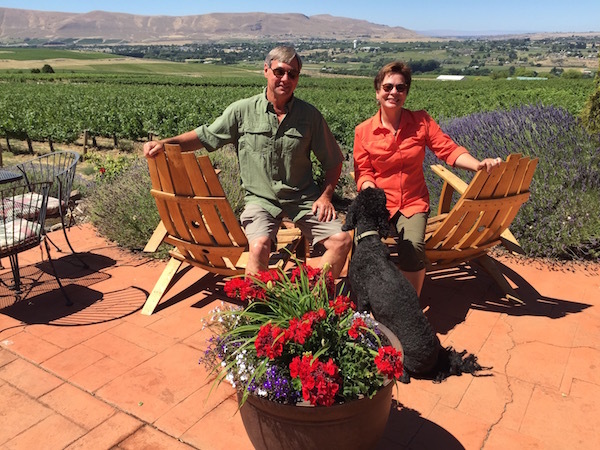 The Pearsons also operate two VRBO homes on Red Mountain, and they are preparing for a Rhône River wine lovers’ cruise this fall which they are serving as hosts for. Meanwhile, Larry will hit the road more often in his new role on the board of the wine commission. “I’d been approached over the years, but I was traveling so much,” he said. He would seem to be an ideal fit for his post, which called for a grower with less than 50 acres who also operates a winery. And thanks to the success of Tapteil and his neighbors, the ride up Red Mountain is considerably smoother for everyone than when the wine-loving engineer first arrived. “Sunset Road was a very rough gravel road for over two miles to get up here, and it was that way until 2001,” he said.